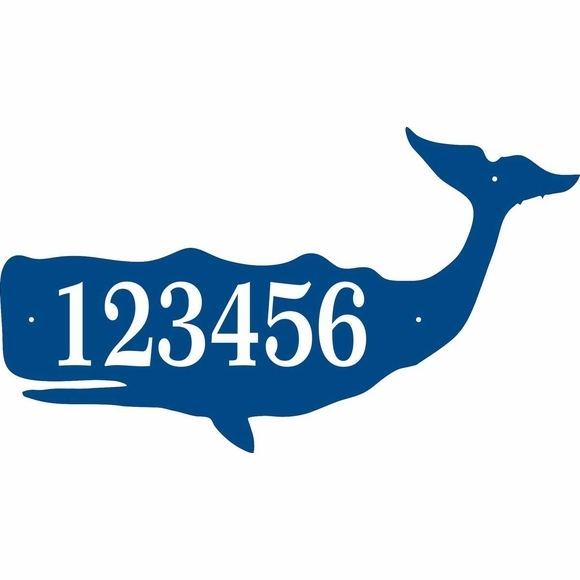 Sperm Whale Shape Address Sign - - Large personalized Whale silhouette address sign is approximately 20"W x 11.25"H and can hold up to six (6) 3� characters. Custom made just for you. Made in the USA. Wall mount address sign is custom made with your address and color choice. Holds up to four (4) 3-1/2" characters or up to six (6) 3" characters. Dimensions: 20"W x 11.25"H x 1/8". More whale silhouette sizes available: can scale smaller or larger up to 36" wide. Please contact us with your requirements. Address on this sign: 123456.